Blade length : 67.4 cm or 26.53 inches. Era : Edo period around Anei 7(1778). Shape : Wide and thick Katana, Kissaki is long. Jigane : Ko-Itame Hada well grained. The Jigane is blackish. This is typical Satsuma blade. Hamon : Nie Deki, Suguha base Hamon with Notare and Gunome Midare. In Ha, there are many Ashi. There are many Nie around the Monouchi part. Boshi is round Yakisage style. Special feature: Satsuma Ju Masafusa was a son of Tawara Uemon Ujifusa. Masafusa continued some generations from Kan-ei era(around 1624) to late Edo period. Tsuba : Thin Mokko shape iron Tsuba with Amida Yasuri pattern. Menuki : Brass, sword and dragon are engraved with gold color. 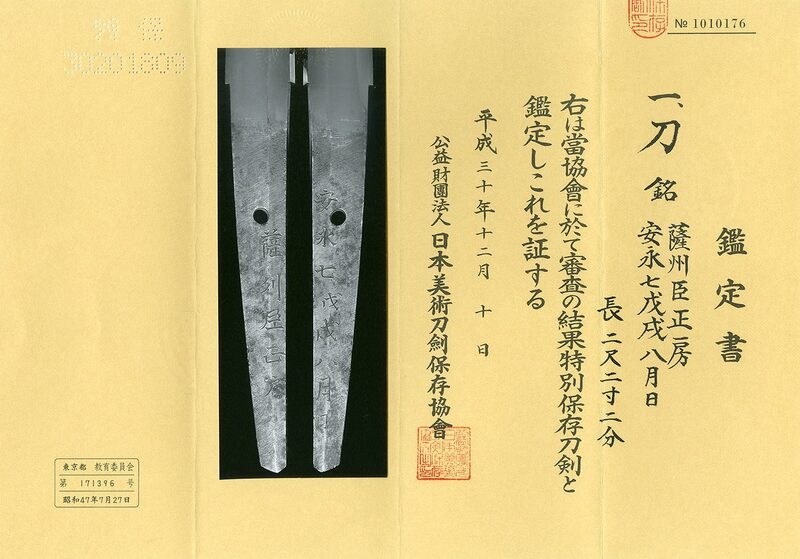 Fuchikashira: Iron, dragon is engraved.